Last night saw Adriatic DMC win another award, this time at the Tourism and Strategy Festival held in Dubrovnik. The leading destination management company was awarded the prize for the best marketing campaign for its video and offline materials promoting travel programs and services in Croatia. In its fourth year, the festival brings together professionals and academics from the tourism sector. This year's theme was 'Cruise holidays and cities – opportunities and challenges'. Participants included Cindy D'Aoust, president of Cruise Lines International Association and Emmy award-winning CBS journalist, Peter Greenberg. Adriatic DMC sales and marketing director, Perisa Boko said of the win: “To be recognized by the judges for our marketing efforts to promote the beautiful destinations, brilliant experiences and wonderful individuals we introduce tourists to is an honor. “At Adriatic DMC we work hard to operate responsibly in our destinations and part of that includes our commitment to promoting less well-known areas and experiences, something which we've done with our new video series. 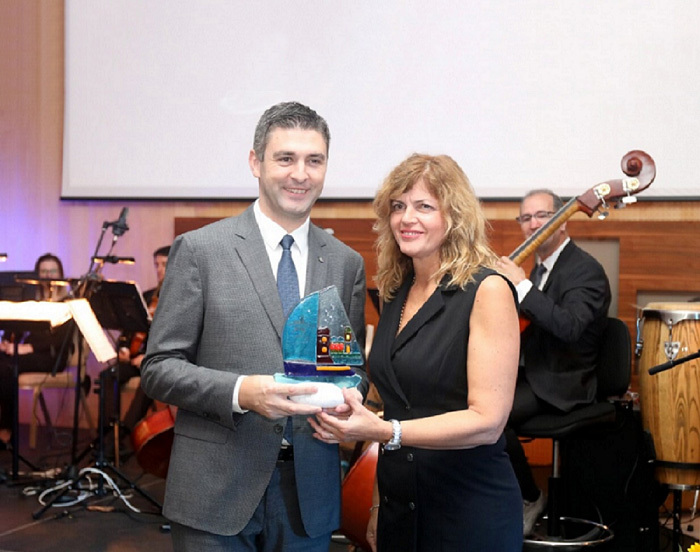 Pictured accepting Adriatic DMC's award from Dubrovnik Mayor Mato Frankovic is Romana Vlasic, director of Dubrovnik City Tourist Board.